Ouno Design » Concrete planters. What happened? Whither minimalism? Whither design? Whatever happened to planters like these two? They may still be in production, but wherever they are still available, and that’s nearly nowhere, they’re civic-sized, weigh 500-1000 pounds, and are out of scale for people’s home gardens. Why? Whither modernism for domestic landscaping? After a golden age of simple, sophisticated design in the 60s and 70s, the commercial design industry is taking us in the direction of cheapness, ornateness, bad nostalgia and the whole philosophy that goes with it. Think this argument is overblown? See what artist Rafael Lozano-Hemmer says about design and cities in this great talk here (start at 1:15 if you’re in a hurry). “What civic politicians mean by [civic] regeneration is putting 19th-century lampposts and Starbucks and a nice kind of 19th-century kind of faux originality.” His comments aren’t specifically about commercial design products but they point to a widespread mindset that encourages stuffy Edwardianism all over the place. Luckily someone went against the faux-Olde Worlde trend in Vancouver’s Yaletown, as you can see here, but this type of simplicity is getting rarer and rarer. I’m writing this in response to my friend Gavin, who took the above photos in Vancouver’s Yaletown and wanted to know where to find objects like these. And he’s not alone. But the answer is that you can’t these things. Last year I looked everywhere for both types of planters above—cement or aggregate concrete planters free of detail, totally plain, no curves, no angles, no tapering, no lip. Impossible. What you get these days is more or less what you see in the photo below. The salesperson at Sanderson Concrete near Vancouver couldn’t understand why I made such a strong distinction between the two, but to me it’s European modernism in a fight with a B-movie version of Sherlock Holmes’ London. The planter above is pure, minimalist and cool; the planter below is stuffier, non-modern, bourgier, not to mention its two finishes are at war with one another. If the planter is cast, why not cast it of all one material? What meaningful relationship do the two tones have to each other? The overly smooth interior is poured into what was a relatively attractive exterior if you can ignore the pointless lip. Nowadays everything has weird curves and tapers and that dreadful, plasticky edge. Each of these formal decisions radically changes the object’s aesthetic and historical associations. 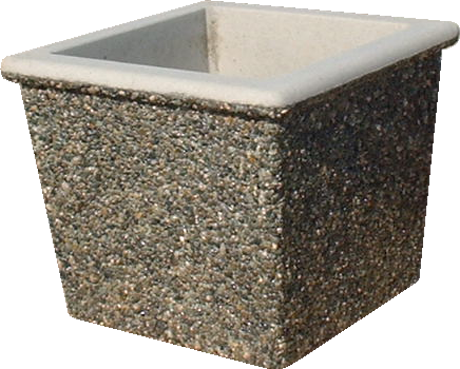 My neighbour, seeking a modern aesthetic but not finding one in concrete, finally ordered the fibrecrete planter from DWR, below. 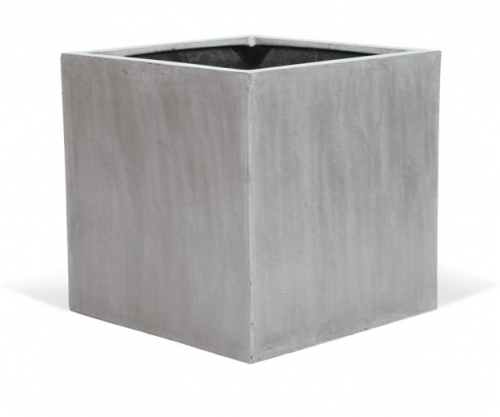 It’s a nearly cuboid, nearly detail-free, faux concrete planter. Too bad about the mild flare, though, and it’s not cheap either. Sadly, when the shipment arrived the colour was the farthest thing from the concrete-colour in the catalogue, and was instead a sort of Edwardian blue. See the photo. The DWR planter may pretend it’s “concrete” in colour but the house’s real concrete steps and foundation are a silent rebuttal. They know what concrete looks like; they are concrete. Even after a year, the blue finish of those planters bothers me. If someone would please give me a credible political/aesthetic economic explanation of why the industry doesn’t think the market will support pure concrete minimalism I’d appreciate it. Whatever happened to niche markets? Even fairly large niche markets? Maybe don’t answer that. Given recent world events this may all seem a trivial concern, but it’s just one small example of problems endemic in the whole design/homewares industry and by extension across our entire built environment. It’s an example of the way in which mass production and concentration of ownership married to lowest-common-denominator market research are cheapening design, and filling our surroundings with a sort of crass, faux-historical conservatism that will look even worse in a few years’ time. It’s wasteful, and it’s unfortunate that just when people are willing to buy fewer things but spend a little more on better-designed products, design products are getting much, much worse—they’re too pointlessly detailed, they’ll never be classic, and they won’t be aesthetically long-wearing. There’s nothing wrong with historical styles, if they make sense in context and are done faithfully, but how often is this the case? This is even true with historical modernism – say goodbye to chrome and clean lines, say hello to powder coated chair legs in eccentric shapes; IKEA I’m talking to you. I wish people would insist on better design by refusing to buy this dreck. Tell Sanderson Concrete & friends to go back and make at least a few products the old way. (They’re tired of hearing from me.) If you agree, email them here or badger your local dealer. 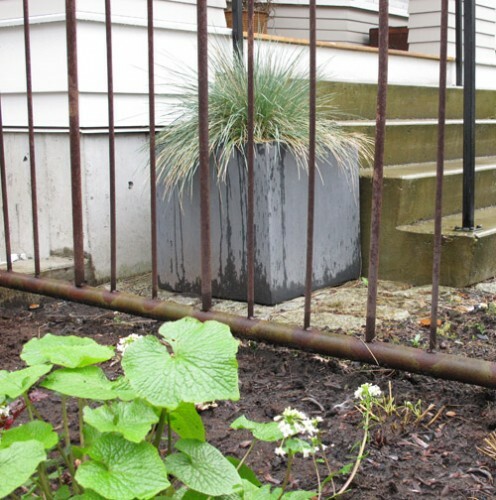 PS To all those who are asking – that’s a wasabi plant in my garden, in the foreground of the photo above. 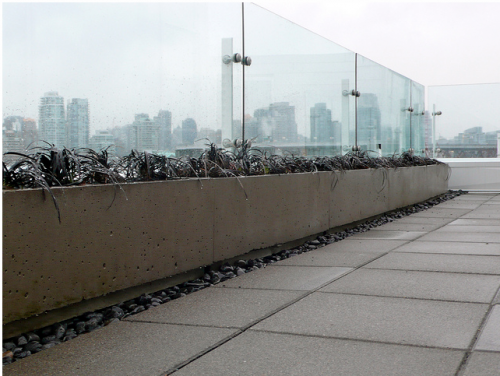 Below are some great custom-cast planters by Vancouver’s Considered Design. This entry was posted on Friday, April 1st, 2011 at 1:23 pm	and is filed under British Columbia, design, landscaping, politics, Vancouver, video. You can follow any responses to this entry through the RSS 2.0 feed. You can leave a response, or trackback from your own site. Argh, no! Please call me next time! Yes, I want those very badly. Can I print that photo and credit you? PS Gavin mentioned Solus too but their planters seem to have some of the same problems as the ones my friend got from DWR. 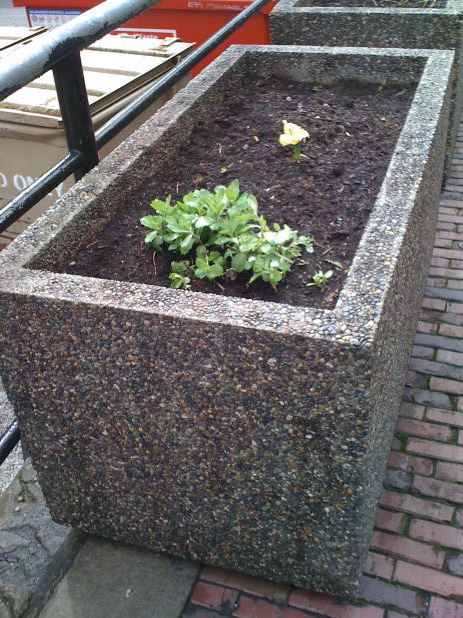 PPS Caban in Vancouver used to sell perfectly minimal square aggregate planters like the one shown near the top, but they went out of business. The best immediate solution is to make your own. I have an old Sunset Books volume that describes some simple techniques for producing containers that look better than anything being offered for sale. Gene, I’ve been been coming to the same conclusion. I will definitely let you know if we come across anymore! some of the eternit ones are quite plastic-looking in the images, but I think the ‘grey’ ones look more like concrete, although they are fiber cement! For sure, use any of those images! Hi Bluehaunt – I agree. The fibrecrete doesn’t last, whereas my mother still has an aggregate planter I remember from my childhood. These are quite interesting, stacking modular planters. Pricey though. But would last forever. I also love these simple classic planters. Ornamental Stone in WA makes a variety of planters and some good smaller sizes. You could probably buy a concrete stain to recolor the DWR planters. Or use Hardiepanel and build your own if you didn’t want to pour them. Funny, just stumbled across this on my planter hunt. Did you ever figure out a good spot? Linda – I still haven’t found anything good – either in real or fake concrete! I can’t believe how ugly everything is. 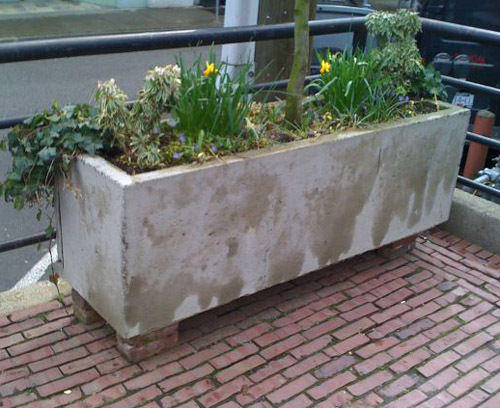 Wonderful to see that people view concrete so highly, I have many of the classic clean lines modular concrete planters. If i can be of any help.